…at a hefty price, no doubt. 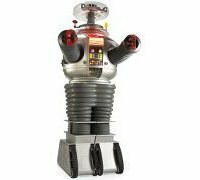 The 6 1/2-foot, animatronic remote-controlled version of the B-9™ Environmental Control Robot from the classic Lost In Space® television series which ran from 1965 to 1968 retails for a jaw dropping $24,500. I thought when I started working, I would be able to afford all the toys I ever wanted, but I guess the price of toys have outgrown my earning power.